The Rebel Sweetheart. : G&L Clothing | The Store for All Sizes. I love shopping, and I'm sure most women do, too. But when you're a mom, chances are, you're shopping not just for yourself. You're most likely shopping for your husband, and your kids, as well. Whenever I'm shopping for my family of three, whether online or at a physical store, I prefer going to just one place where I can find everything that I need. 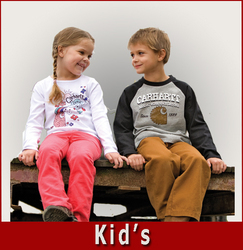 Some place like G&L Clothing, where they have just about everything for the whole family - something for moms, for dads, and for the kids. Best of all, they have a special line for big and tall sizes, which are quite difficult to find - sometimes unavailable - at most online stores. And if you're a jeans-T-shirt-sneakers girl like me, you'd be pleased to know that G&L Clothing houses some of the most famous names in the clothing and shoe industry. From Levi's to Dickies, Converse to Merrell, they all have these in-store. G&L Clothing is also one of the largest full-line Carhartt retailers in the US, and the first in the country to offer Carhartt's women's workwear line. G&L makes shopping even more convenient as they ship items directly to their customers. Residents of Des Moines, Iowa have the pick-up in-store option, where they can shop online and claim their orders at the G&L Clothing physical store. International shipping is also available, however, brands such as Carhartt, Levi's, Dickies, and Dockers have certain restrictions and can not be shipped outside the US. Shipping is done through UPS for both domestic and international orders.